"This bright and colorful salad is a great summertime recipe (or anytime you want to feel like it's summertime). Light and citrusy, it's a whole new way to enjoy quinoa. Lime juice and cilantro give a refreshing kick, while quinoa and black beans provide tasty vegan protein. If you're not vegan, add even more protein by adding chunks of chicken or turkey. Yum!" This salad tastes great right away, and even better the next day when all the flavors have had the chance to marry. Enjoy! You can also steam the quinoa instead of boiling if desired. 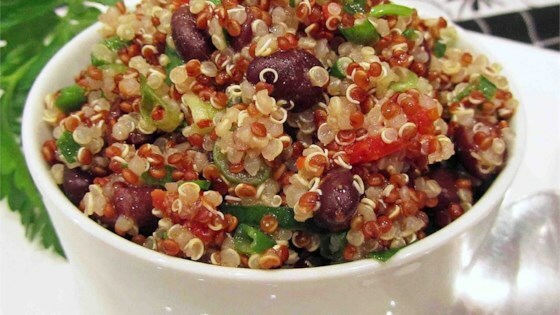 This is my absolute favorite quinoa recipe! I have been looking for one my whole family would eat and not only did they like this...they asked for seconds!